If you want to use the pixel shader without 3D LUT, you likely have to set "this display is already calibrated to BT. 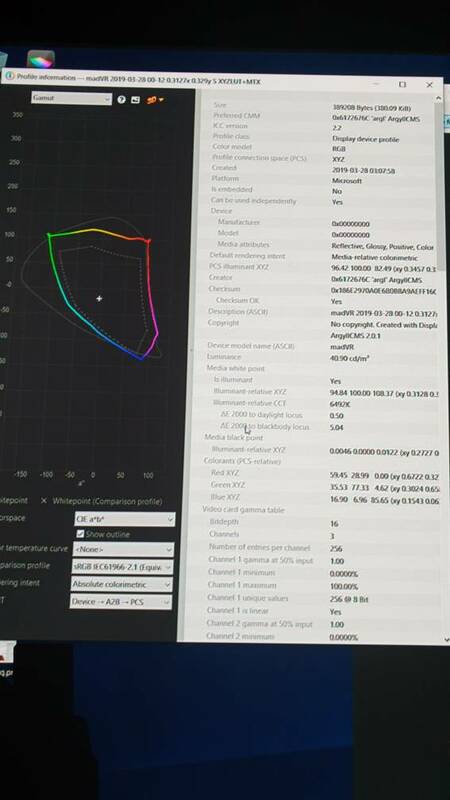 2020" in madVR but make sure this matches the setting of your projector (should already match though, because BT.2020 is what the projector should expect as container format for HDR). I do want to use the 3d lut however what I was saying is the DCI-P3 setting under calibration tab in madvr has more vibrant colours and the 3D LUT I created for DCI-P3 looks very similar to the madvr BT2020 setting under calibration. Just wondered why the DCI-P3 built into the madvr calibration was more vibrant than the 3D LUT? When using the 3D LUT I am also using BT2020 under the colour profile in the JVC is this correct? 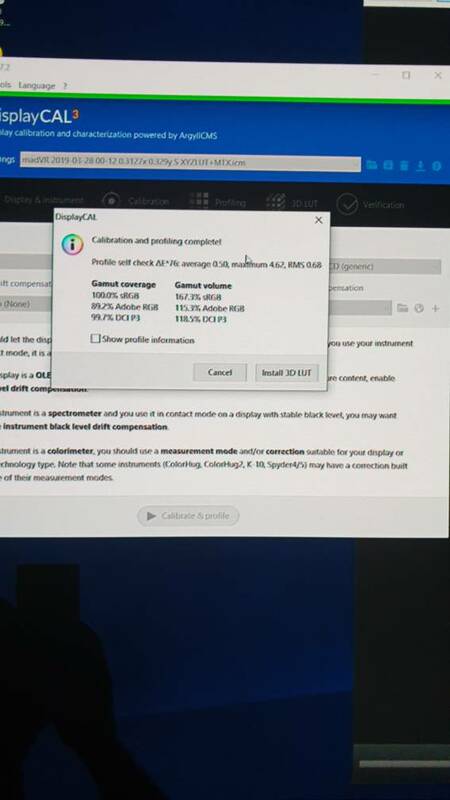 Also if I change the gamma verification in DisplayCAL I assume it will be 2.2 as well. If I do this and re run the calibration process will this make a difference? Just wondered why the DCI-P3 built into the madvr calibration was more vibrant than the 3D LUT? Because it's the wrong setting. Hi @fhoech thanks for all your help.. I did the 3d lut calibration again last night with DisplayCAL and I definitely set to DCI-P3 again, however for some reason it saved the file name as Rec709 instead of DCI-P3. Do you know why this may have happened? I know all my settings in displaycal were set for DCI-P3. I'm guessing it may be because I already had a DCI-P3 file in tye madvr folder (programdata) where it usually saves the 3d lut files. What do you think the reason is it's named the file as REC 709 instead of DCI-P3? 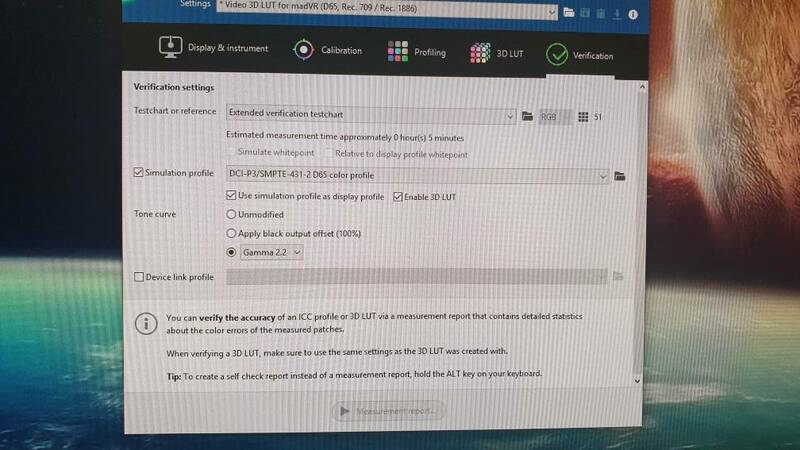 Please find attached pictures of when the calibration finished.. By tye way colours look extremely good and happy with the results.. Only concern is why its showing as rec 709 when I set it up for DCI-P3? I still don't understand what you are asking. The 3D LUT does calibrate gamma. If you use a different picture mode, you need to profile that as well. You can use the Rec. 709 LUT for any input colorspace, but madVR will restrict it to Rec. 709 obviously. So I tried to profile Rec2020 and whatever settings I tried I only ever got a reading of 80% DCI-P3 so I assume something is wrong. I ensured the pattern generator in MadVR was set to Rec2020 output, I tried both SDR and HDR modes. I made sure the report Rec2020 to the display was checked in the MadVR settings but to no avail. I'm using a X-Rite i1Display Pro. and not all screens care about "send bt 2020". The 3D LUT slot is auto-detected from the primaries of the source profile you chose. Make sure you chose DCI-P3 D65. That's just the name of the 3D LUT slot in madVR. You can set any input colorspace (BT. 2020, P3, Rec. 709...) in any slot and madVR will still do the correct thing. So I tried to profile Rec2020 and whatever settings I tried I only ever got a reading of 80% DCI-P3 so I assume something is wrong. Nothing's wrong here - if your native projector/TV gamut is 80% DCI-P3, then there is no way changing that. Note that in BT.2020 mode, all that's happening is that the projector/TV can accept a BT.2020 container format (e.g. in HDR mode, where everything is encoded in a BT.2020 container). It doesn't affect the actual gamut. Thank you for your reply. I did set DCI-P3 in DisplayCAL but what I am saying is the end result was saved as a file name of Rec709.3dlut? What I am wondering is why did it call it and save the 3D LUT file as REC 709 and not DCI-P3? Is it because I already had a DCI-P3 profile which I created in the programdata? Is that the reason it has called it Rec709? Are you saying that it doesn't matter what the LUT file is called as long as I put it into the correct slot in madVR thats all that matters? Sorry as I am sure you are probably fed up with all my questions but I want to make sure I am doing this correct because the file name was created as Rec709 and not DCI-P3? Thank you. he has an OLED so he should have over 90%. and the send BT 2020 option is not active on AMD cards there API is broken. I have a C6 OLED. Rtings measured DCI P3 xy: 96.37 %. I have a GTX 1070. 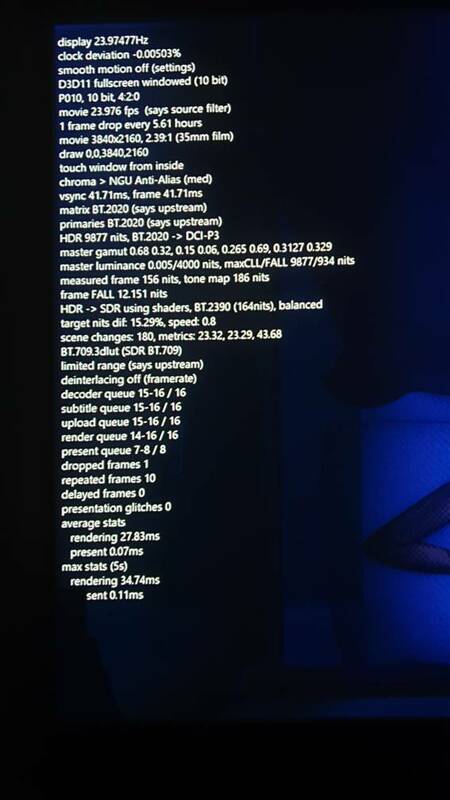 Has anyone calibrated their OLED's and can confirm that they get >95% gamut? Wondering if it's a GPU bug. I do have a JVC x9000 I can test against also. Room isn't fully light controlled though due to a refurb and the days are getting longer. So it's hard to get the time for it to work. Edit: When I open the profile in the profile viewer it shows the colour points as tracking well within DCI-p3. However, when I click the LUT button it seems to expand out those colour points. I'm not sure how to read it. Is it saying that when applying the LUT the colour is being truncated? I've attached the profile if that helps. Last edited by Dushyant Patel91; 03-29-2019 at 03:07 AM. the issue should be your setup. try the send bt 2020 option under calibration in madVR. when calibrating the OLED you don't need to control your room lighting just use it in contact with the screen. I did set DCI-P3 in DisplayCAL but what I am saying is the end result was saved as a file name of Rec709.3dlut? What I am wondering is why did it call it and save the 3D LUT file as REC 709 and not DCI-P3? If I put the Rec709 3lut it saved into the DCI-P3 slot under calibration in madVR would that make a difference or do I need to re calibrate now? The 3D LUT slot is auto-detected from the primaries of the source profile you chose. You can set any input colorspace (BT. 2020, P3, Rec. 709...) in any slot and madVR will still do the correct thing. All that's saying is that your TV cannot be accurately characterized by a matrix. This has nothing to do with the 3D LUT. Thank you for your reply. I have created a DCI-P3 3D LUT again yesterday and it has named it correctly. I completely understand what you're saying and thank you. It doesn't matter which slot I put it I madvr will deal with whatever the source is as you say. So for example if I add the rec 709 and the DCI-P3 it will use the DCI-P3 lut file for my 4K HDR movies as I use madvr to do tone mapping and they are originally BT2020 colour space.. The only thing I would say is that I prefer the Rec709 lut file over the DCI-P3. The reason is the Rec709 seems to have better colour and seems more dynamic than the DCI-P3 lut file. I wonder if anyone else on this thread who is using a projector and is doing tone mapping with madvr, what they use for 4K movies? Rec 709 or the DCI-P3 lut? Would there be any point for me to create a 3d lut via display cal on the madvr HDR option at all or will this be pointless as I am doing tone mapping with madvr? Thank you..
That seems surprising. You are effectively telling madVR to limit your projector gamut to Rec. 709, clipping HDR movies color (which definitely, at least in part, exceed the rec. 709 gamut), even though your projector could show a good percentage of the P3 gamut. Would there be any point for me to create a 3d lut via display cal on the madvr HDR option at all or will this be pointless as I am doing tone mapping with madvr? No, because of the latter. Yes, that way you get the benefit of madVR's dithering (for example) during the measurements. 1. in the calibration tab the whitepoint should i leave it at chromaticity coordinates or set it to 6500k? 2. in the 3d LUT tab i left everything standart was not sure with rendering intent and also tonecurve is rec 1886 gamma 2.4? 3. input encoding i cant change to 0-255 what should i set in madvr? - on the other display (monitor) DisplayCal reads that "measurement is finished, the meter can be removed from the screen", on the TV the last patch is still visible, but Windows popup is there on the monitor saying: "Close this program, DisplayCal is unresponding"
- when I do the above: the main DisplaCal window is back saying: measurement has not been finished. I didn't have time to run it 1 more time. Can the new ArgyllCMS 2.1.0 x64 be the culprit? Last edited by chros73; 04-16-2019 at 02:22 AM. I have had intermittent crashes with recent displaycal and madvr test builds too. Occurred with 32 and 64 bit on Argyll 2.0.1 (iirc). Thanks, what's your solution? Revert DisplayCal (to previous 3.7.1) or madvr (to stable build)? So far retrying has been sufficient to get a measurement through. When you select the "Video 3D LUT for madVR (D65, Rec. 709 / Rec. 1886)" preset, the chromacity coordinates you see there are the correct ones for D65 (which is 6504K in fact); leave it like that to have the 3D LUT correct your whitepoint to D65. You can leave everything else at default. If you get clipped values, is likely because of the TV controls adjustments are making the TV reaching the limits of the gamut. Try and see if the TV can be set to a "native gamut" mode (it could be called "Wide"), and chose that before trying a new calibration. Also, look in the TV settings and see if there are settings for gamma: if the TV has a BT1886 setting, then chose it (it would match the same BT.1886 value configured in the DisplayCal 3D LUT tab). This way you're also improving the chances of running into clipping and posterization. If not, maybe the TV has a Gamma 2.4 or Gamma 2.2 setting - chose it in that case; the 3D LUT will still correct it to a BT1886 tone curve, though the chances to experience banding could be higher. Can you please help me better understand my options when attempting to implement HDR on an older projector which does not have this feature. I have a JVC DLA-SH4K which has an output rez of 4096 x 2400 which is 10 megapixels, you can see the spec sheet here http://pro.jvc.com/pro/attributes/PR...4K-E060608.pdf. I'm using a Panasonic DP-UB820 4K Ultra HD connected to a Video Process which outputs four DVI-D channels of 2048 x 1200 to the projector's four DVI-D inputs which allow the projector to produce it's 4096 x 2400 picture. My question - Can I use a emulator like the Atlona Etude Sync Emulator (https://atlona.com/product/at-etu-sync/) to fake HDR for my projector or is an HTCP with MadVR my only option. I'm trying to avoid the HTPC if possible. Let me know if you need any other details about my setup. maybe you should grab the error message so it can be seen where the issue is and be fixed. I just described the issue above. Thanks, that's confirming that madvr is the problem. Yesterday evening I created another 3dlut with latest stable (0.9.17) without any issues. that's not an error or an proper error message and doesn't mean you have the same issue even through it'S likely to be the same. have a look at the event manager. crashes don't tend to leave proper error messages, it is an unexpected crash after all. Regardless that is all that my system logs (inc in the event viewer) when it happens. In search of a Excellent 7CH amplifier with balls!